Closing out the week with more good news in the world of bioprinting! 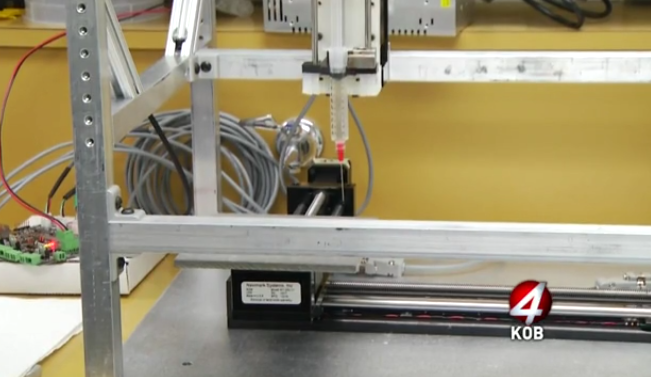 Just a couple years back, University of New Mexico Valencia campus introduced 3D printing to their curriculum. Researchers located in the Albuquerque campus are now attempting to use a 3D Bioprinter to improve the outcomes for hand and wrist surgeries. The Orthopaedics & Rehabilitation Research Division is hoping that through a combination of these techniques and electrospinnning, they can fabricate hybrid bone-ligament tissue which could possibly be used in joint replacement surgeries. A couple of years ago, 3D printing entered the curriculum at the University of New Mexico’s (UNM)Valencia campus, and researchers at the main campus in Albuquerque are now attempting to use 3D bioprinting techniques to improve the overall outcomes in hand and wrist surgeries. Researchers with the UNM Department of Orthopaedics & Rehabilitation’s Research Division are hoping that through a combination of these techniques and electrospinning, they will be able to fabricate hybrid bone-ligament tissue, which could potentially be used in joint replacement surgeries. Recently the research division was awarded a grant from the American Foundation of Surgery of the Hand which will be used to develop bone ligament adherence systems. They will use patient specific anatomy and a 3D printer. Read below to see how they are going about this amazing project. Faces of bioprinting: Meet CELLINK product specialist, Saviz Ehyai!